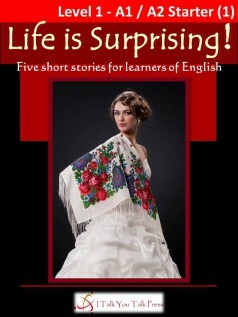 Home » English Graded Readers » Level 1 » Life is Surprising! There are five short stories in this book. Each story has a surprise ending! Carlos is a taxi driver. He is in love with Maria. He dreams that Maria is his girlfriend, but he cannot speak to her. She died in 1929. One day, Carlos finds an earring in his taxi. There is a link between the earring and Maria. What is it? Will the earring help Carlos to find real love? Who was the nurse with the candle? And what did she do to Min-ji? Christina is alone in a dark forest. Her car has no gas. Then, she meets a man. The man helps her. The next day, Christina goes back to the forest to give the man a present. But he is not there. Where is he? Christina is shocked when she finds the answer. Enjoy these stories and two more in Life is Surprising!